Almost all new ceiling fans today are equipped with a remote control, especially higher-priced ceiling fans. The receiver part of the remote is nestled inside the fan body itself, while the control mounts either on the wall or into the wall as a switch. If you've been thinking about replacing your existing ceiling fans, it is relatively easy to do this project yourself. If you can change out a receptacle, you can install a ceiling fan. Here are more details for this DIY home improvement project. Ceiling Height: Ceiling heights below nine feet might require a fan that hugs the ceiling, known as a flush mount, so you don't get your head chopped off when walking under spinning blades. Find out the distance between the ceiling and the bottom of the fan, referred to as the hanging depth. Allow at least seven feet from the bottom of the fan to the floor. Blade Sweep: Experts say that the number of blades isn't as important as the size of the motor and the length of the blades. Larger motors cost more than smaller motors. Blades that measure 52 inches work better in rooms that are greater than 15 feet in length; whereas 44-inch blades are made for smaller rooms. 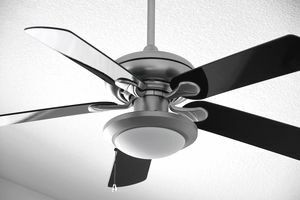 If you are replacing a smaller fan with a larger fan, make sure the blades will not hit another object in the room, such as a door. Allow a minimum of 18 inches from the tip of the blade to the wall. Lighting Options: Note that if you choose a light fixture requiring a fluorescent lamp, that fixture is unlikely to be compatible with a dimmer switch, and you may need to replace your light switch beforehand. Consider whether you want light to flood the room or to illuminate the ceiling. Fan Diameter: In most instances, your fan body will sit flush with the ceiling. If the diameter of your existing fan housing is smaller than your new fan, no problem. But if your new fan housing is smaller than the original, you will need to paint or otherwise fix the ceiling after installation. Part Identification: You may say to yourself: "Who cares? I don't know what these parts are much less where they go." But do try to identify them, including the hardware. Housing Body Attachment: After the plate is installed, look for a hook or a hanging mechanism that will support the weight of the fan while you are attaching the wires together. This is helpful if you do not have three hands. Nestle the receiver inside and follow manufacturer instructions for attaching the body or collar to the plate. Secure with set screws. Lamp Installation: Attach the lamp or bulb to the fixture. Before you proceed, turn on the power. Press the remote to check that the light works and the body where the blades will attach spins. If it does not work, most likely a connection from the receiver to the junction box is loose. Before proceeding, shut off the power. Check and fix. Blades Position: Most fan blades are marked up or down. Make sure your fan blade faces the right direction and slip it into the slot. If screws are provided, use them. Shade Attachment: Most fans that come with a light also include a shade or a cap. Attach it as your final step, and you're finished. While you have a variety of options to choose from, the two most common are either a wall control switch or hand-held remote control. Some wall switch controls cost extra, but at least you will always know where to find the remote control -- it's in the wall switch. Wall Control Switch: If your option includes a wall control, turn off the electricity and remove the existing wall switch. Note how the wires are attached and reattach them to the remote switch the same way. If you see a white wire, test it to determine if it is hot. White wires that are hot should be marked black, but not everybody marks them. Cap with wire nuts and test. If you are uncertain how the wires attach, consult an electrician. Remote Receiver: This is a small rectangular box with DIP switches (a series of tiny buttons all set in one direction) and three to four wires. Insert the battery into the receiver. The wires will likely be white (neutral), black (hot) blue (light) and copper or green for grounding. This unit rests inside the fan body. After you turn off the electricity, you will connect the wires from the receiver to the wires coming out of the ceiling, securing each color combo with wire nuts. DIP Switches: If you are installing more than one remote-controlled ceiling fan, set the DIP switches on both the receiver and the control of one fan to an identical alternate sequence (such as "all up" rather than "all down"). Otherwise, when you turn off the ceiling fan in one room, it will turn off the fan in the adjoining room. Junction Box Preparation: Make sure your junction box can support the weight of a new fan before you install the plate for the new fan. Many weigh about 50 pounds. You can use the same screws to attach the new plate or use the screws that came with your fan. Do not attempt to touch the wires without turning off the electricity to the house.